And there you have it, folks, the dividing line between those who can take some lactic sourness in their brews, and those who would just as soon forego the pleasure. Lynn didn’t much care for it either, but she did detect the wildly fruity aroma put out by this dark reddish brown brew–cranberries, currents, cherries, though there’s a rill of caramel sweetness running through as well. The palate is like a high sour tartness, puckering and refreshing if you’re up for it, and I was, after a long day in the snow. We awoke to a good eight inches of fine packing snow, and Mike and I labored for quite a while in the morning unearthing cars and clearing paths on the deck. 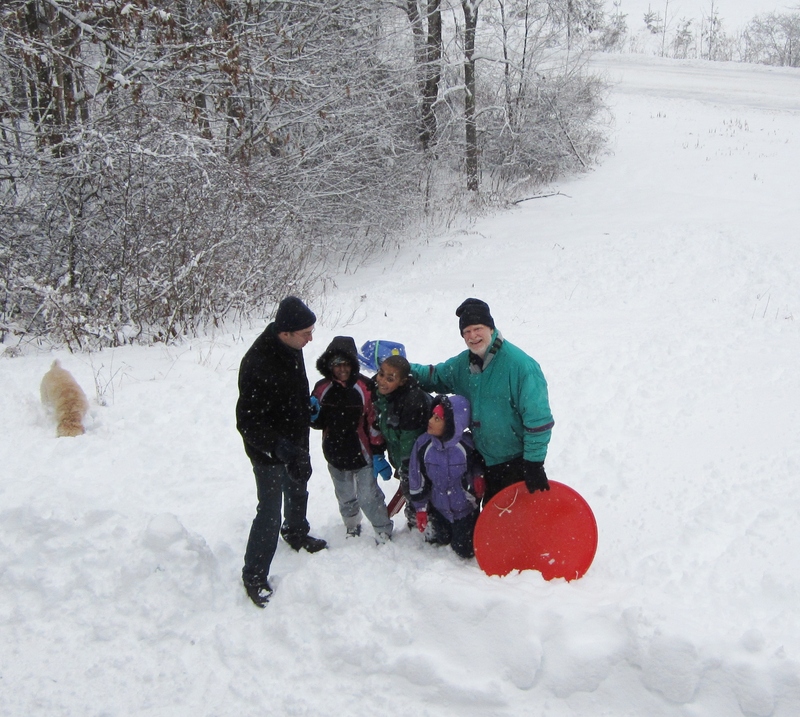 After a not-long-enough interregnum we had to get the kids outside to pack down sledding paths on the front hill, and we kept at it until their hands were numb or exhaustion from walking back up the slope did them in. We were sort of beyond exhaustion ourselves. We actually had a Harpoon Winter Warmer just to start things off and in keeping with the theme of late, the always agreeable 5.9% spiced ale from the Boston and Vermont brewery. The Jolly Pumpkin, like all of that brewery’s offerings, is a different animal. (See a bit about the De Viento brew in the Stocking Up for Sandy sixpack.) With all of his beers fermented in oak barrels, and then reconditioned in the bottle, Ron Jeffries continues to turn out wild and earthy brews that one needs to be prepared for, or they may just be too over the top to process. There’s no lack of sour brewing going on in the U.S. right now; it may be the last frontier for those trying to push the envelope and still a total novelty for many.